Although they have different dimensions, the upper drawer fronts and lower drawer fronts are constructed in exactly the same manner. Each drawer front is nothing more than a center panel of 1/4-inch-thick plywood inserted into a 1 x 2 frame and trimmed with decorative molding CFigure 14). It's not difficult to do, but it does require a certain amount of precision when cutting to obtain a professional-looking finished product. For the best results, don't hurry the process, and be meticulous in your work. To make one upper drawer front, cut one 10-1/2-inch by 4-1/2-inch drawer panel (BB) from 1/4-inch-thick plywood. Cut two top/bottom frame pieces (CC) from 1 x2 pine, each 10-1/4 inches long. Cut two side frame pieces (DD) from 1x2 pine, each 5-1/2 inches long. Cut a l/4-i,nch by 1/4-inch dado along the center of the inside edges of each of the frame pieces (CC and DD) to accommodate the drawer panel (BB), as shown in Figure 14. Place the drawer panel (BB) into the dadoes cut in the drawer frame pieces (CC and DD). Glue and clamp, then nail the drawer frame pieces (CC and DD) together. 1 / 4-inch cove molding to fit around the inside edges of the frame. Setting each piece of cove molding with the curved side up, miter both ends at a 45-degree angle. Attach the mitered pieces to the drawer frames (CC and DD) with glue and wire brads. Repeat steps 1 through 6 three more times to assemble the remaining upper drawer fronts. The two lower drawer fronts are identical with the upper ones, except that they are 1 inch taller. 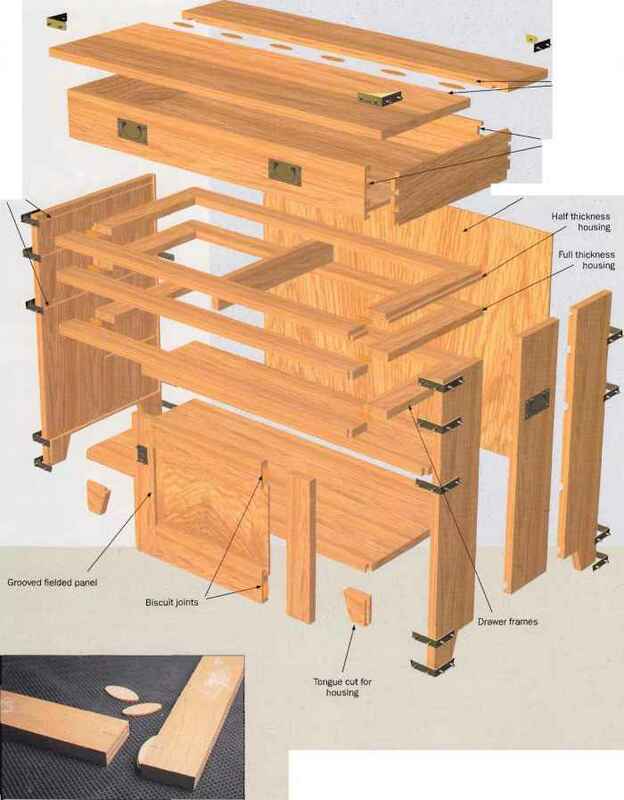 To construct the two lower drawer fronts, repeat steps 1 through 6 twice more, but with the following modifications: cut the lower drawer panel (BB2) 10-1/2 by 6-1/2 inches (from 1/4-inch-thick plywood); cut each of the two lower drawer-front side frame pieces (DD2) 6-1/2 inches long (from 1x2 pine).